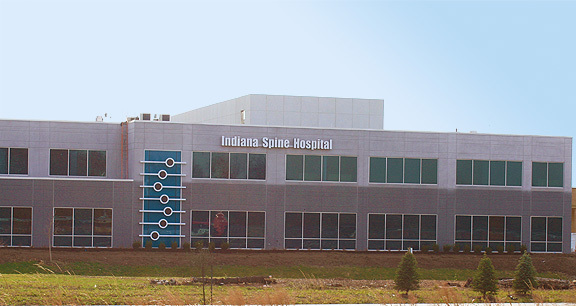 Project obstacles and solutions: The Indiana Spine Hospital is a new medical facility that was constructed in 2016. The two-story, 50,000 square foot building includes three operating rooms, 20 inpatient rooms, a radiology unit and an outpatient clinic. Turnkey operations were to happen 14 months after ground was broken. Browning was the general contractor for this project and Rescom performed all of the concrete finishing. The two floors of the hospital were poured using Aridus Rapid Drying Concrete. The upper floor used a lightweight mix and the main floor was poured with normal weight Aridus. As is often the case, the concrete floors were finished 3-1/2 months before the roof was complete and the building was enclosed. With each rainstorm, the concrete was soaked with water. Normal concrete can take up to 9 months to dry out to the point that flooring adhesives can be applied without moisture causing delamination. Due to the tight construction schedule, this was not possible. The Aridus Concrete was able to chemically dry out the excess water as soon as the building was enclosed. Lightweight Aridus is guaranteed to dry out to a relative humidity (RH) of 80% in 120 days after the building is enclosed and the HVAC is operating. Likewise, normal weight Aridus, in the same conditions, is guaranteed to dry out to 80% RH in 45 days or less. This exceeds the threshold of acceptable RH for adhesive manufacturers. The flooring contractors had no problem with their adhesives sticking to the Aridus floor slabs. Neither did they have any issues with leveling adhesives drying out properly prior to laying floor coverings.